Packs of soft drinks like coke, Gatorade, Pepsi, Solo, Schweppes, Berri Fruit Juice, and more are available in the drinks & snack sale of Coles Catalogue. See the details of these on pg 16&17. Favourite chocolate brands like Cadbury are the main things to find in the snack range of Coles. You have Snickers Toblerone, Cadbury Dairy milk, Infuzions, Red Rock Deli Chips, and more are going to cost only half this week at Coles Stores. Browse them on pg 17. You will feel fine with the refreshment coming with your favourite soda drink. They are the favourite brands of everyone. I recommend everyone stocking up these snacks while they have the chance of buying them at these low prices. Red Rock Deli chips, Mars, Thins, CC's, and more are on sale. Save $8 on Ferrero Rocher chocolate 30 pack that is only $11 at Coles starting on Wed. Arnott's fruits & roots biscuits will cost only $4.50! Save $1.50 on that special and new product at Coles. Sirena Tuna fish is also a special deal. 425g can is $5.50 and 185g cans will be $3.30. Seafood for Lent is an interesting and tasty part of the Coles grocery this week. You can learn new recipes. Salmon, Beans & Pea Risotto recipe is on pg 23. Necessary ingredients for this recipe are on sale. If you are someone like me who hates cooking, canned meal variety of brands like Heinz are exactly for you. They are cheaper than eating out. Find many more products and categories in the pantry-snacks part of the latest Coles Catalogue. Follow our Facebook page to get these on your feed. Subscribe to get emails. Get your protein need from the finest meat by Coles meat dept. Australian lamb forequarter chops will cost only $14 kg! Shop a lot of half-price products at Coles supermarket this week. Find them all on the Coles Catalogue Grocery Sale 20 - 26 Mar. Red Bull Energy drink, John West Tuna fish, Smith's chips, Colgate Sensitive, and more products are going to be a good deal starting on Wednesday. A free stikeez deal is still valid at Coles stores. You should consume fresh and healthy fruits and vegs. Buy them at fantastic prices and get bonus stikeez with your purchases of $30 on apples, avocado, cucumber, mushroom, potatoes, lemons, and more. Enjoy the quality moments with your family, participate the community activities for Easter this month. Seafood for Lent is available on sale. Finest sausages, no-added-hormones beef porterhouse, chicken breast fillet, chicken kebabs, and more are valid in the new range of Coles supermarket in the catalogue. Coles Catalogue also offers hot cross buns. It's one of the traditional tastes of the Easter days. Finest indulgent traditional hot cross buns, Belgian chocolate flavour, and more tasty foods are waiting in this shelf. In the deli, you will find classic and tasty meat slices, hot roast chicken, twiggy sticks, and similar delicious foods. Primo sliced meat 80-100g pack is only $2.50 this week at Coles. Black Swan classic dip, French onion, Daily orange juice, and more are featured items of the deli-fridge sale. Refill your fridge with the best foods. Save on these food products with the Coles Catalogue prices. One of the main sources of probiotics is Greek yoghurt. Australia has a really nice range of brands for this kind of yoghurt variety. View pg 14-15 for the best kinds of them and very good prices by Coles. Subscribe to Coles Catalogue to get emails about the new deals. Oral-B, Pantene, Head & Shoulders, OGX, and more brands of products for personal care are available in the latest Coles Catalogue. Today's world is exhausting in a very irregular shape and system. During daily life, everybody has got an issue about self-care since the working hours might extend all the time. We feel like garbage when we get home in the evenings. For those who work with using a lot of body force, it's even worse. But you need no worries for the solutions of these problems. The easiest way to handle that is to get rid of the exhaustion and tired boy as soon as possible when you get home. To do that, you need proper tools, high-quality chemicals, and most importantly the best prices because nobody wants to spend so much on the personal care items. Coles Supermarket catalogues can be a way to lessen the amount of what you spend normally on these items. 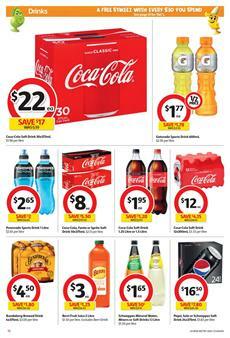 Get the best offers on the latest Coles Catalogue this week. Shop the favorite brands of dental care, hair products, shampoos, and more. Moreover, the catalogue showcases a lot of half prices. Nature's Way kids smart vita gummies, and many more health-care products are also a part of the personal care range of the catalogue. Follow the best deals on the Facebook page or subscribe to the newsletter to get emails. You have a lot of gluten-free products to see in the latest Coles Catalogue. Freedom Foods XO Crunch, Helga's g-free bread, muffins, and more products from the GF sale are available on pg 20. Buy Gravox gravy, Campbell's Real Stock, Praise deli style dressing in the pantry shelves of the supermarket. Moro El Primero extra virgin olive oil will cost $5 only. Save $2 on that olive oil bottle. Get your quick meals and canned goods at Coles for lower prices. There are new half prices on Spam, LeSnak, and price drops of Sirena tuna, Kellogg's Nutri-grain etc. Stock up breakfast foods, too. Quick and time-saving nutrition in the mornings beats any problem. If you like to have a nice hot coffee or tea in the mornings, browsing the Coles Catalogue will be a profitable action because of the new deals on Twinings English breakfast tea and Vittoria Espressotoria capsules. Noodle and pasta are great choices of lunch or dinner in my opinion. Try to consume carbohydrates that are digested for a long time. Sugary things and carbohydrates, which are basically sugar, will directly form into fat on your belly. Instead of that, check out Asian foods or healthy choices that will make you feel better. These are also important for exercising people who need to build some muscles. Check out articles about clean bulk and learn how to build a great body. New frozen food and ice cream variety are available on the catalogue. Shop these prices until 19 Mar. Great offers are browsable now and you can make a shopping list for your weekly needs. Also, find packaged frozen vegetables and fruits in the same category. This aisle is rich in product variety. You can still earn stikeez with the purchases of the participating items. Half-price deals on Up & Go, Oven Bake, Kettle potato chips, Philadelphia on the first page. Coles Catalogue has participating items like Nescafe Blend 43, Garnier Nutrisse and more. These and more are the purchases to get you a new stikeez. A Bonus stikeez is also possible to earn with buying some fresh vegetables or fruits. Rockmelon, pumpkin, mushrooms, red royale potatoes, and more fruits or veg are available in that range. Discover a new fresh sale of the Coles Catalogue. You should also see the fresh-cut meat range of Coles and the deli products on pg 4-5. Beef scotch fillet steak, lamb loin chops, British sausage, and more are the promotions from the meat sale. Save half on family roast chicken. Take a look at the hot cross buns with a bonus stikeez. 4 different versions of the hot cross buns are available there. 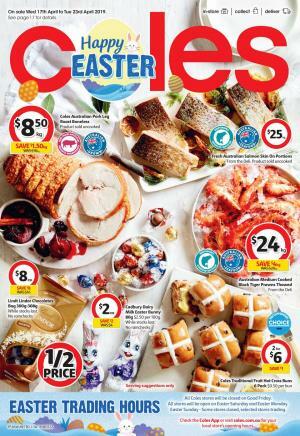 Lenten seafood is a thing in the recent weekly catalogues of Coles. Recipe of Crunchy topped sardines and the deals on John West salmon, sardines, Birds Eye deli chips half price, and more are available on pg 9. Shop Bega cheese for only $6 saving $2.38 this week in the fridge section of Coles. Gippsland twist yogurt is only $5. Help your digestive system with probiotic-rich dairy foods like Greek yogurt. Danone Activia low-fat yoghurt is a probiotic source for your gut. Save $1.40 on a 4x125g pack of this product. Special prices of more milk and yoghurt products are available on pg 12-13. Also, save on snacks with this catalogue price range. You have a SunRice bites mini rice cakes, Fantastic delites rice snacks, and many more products of snacks and beverage sale are available on pg 15-19. Have some snacks around while you are enjoying the comfort of your indoors. Save with the Coles prices.